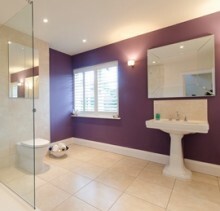 The super stylish project featured here is one that we came to from an early stage. When we first met the clients, they’d recently moved into the property and big plans were afoot for a complete refurbishment. 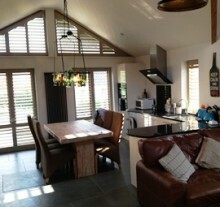 After shutter design consultation, we surveyed all windows and simply kept details on file for whenever they were ready. 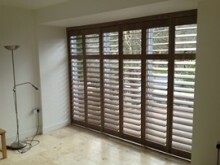 The transformation of the home is stunning and we think our shutters look pretty good too! The area of Clifton, In Bristol has many properties with large bay windows. 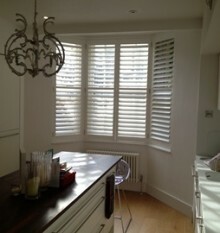 Nothing compares in the dressing of them to the stylish addition of shutters. The clean lines emphasise ‘scale’ from inside and outside of the property and the multiple options on light control and privacy are just perfect for the setting. Welcome to our new team member. His name’s Sebastian, age three (and a half). 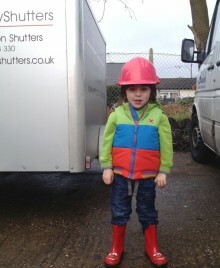 As you can see, he has a cheeky side to him, but we’re training him well and have big plans for him.